Some readers wonder why any kind of personal-finance course isn't already required. Here's what some had to say. 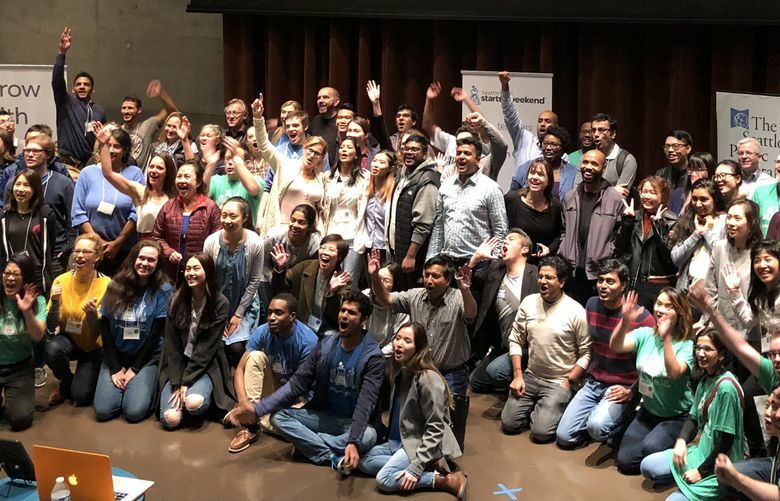 Earlier this month, participants in Seattle’s Startup Weekend EDU brainstormed solutions to problems in our education system for an entire weekend. Among the winners and an audience favorite was Don’t Be Broke, an app with its own curriculum meant to help students graduating high school understand how to manage their finances. Readers responded well to this idea, but many wondered why some sort of personal-finance course wasn’t already required. I shared some of these concerns in our weekly Education Lab newsletter and posed that question to our readers: Should personal-financial management be incorporated into schools? Yes! But drop another required course, please! My son is already taking PE and health requirements outside of school in the summer (through BYU, the recommended school) — costing us about $300/course, with testing, tuition, textbooks, supplies. Why? Because there are so many required courses. If he wants to take 4 years of foreign language and remain in band, he can’t fit them in, and this is with taking algebra and geometry in 7/8 grade. One suggestion (from my 10th grader)—“why do we have to take 4 years of English, unless we are pursuing and English major?”) Actually a good point — and I love English. He’s on the second time through reading/analyzing “To Kill a Mockingbird” and “Lord of the Flies”…both done in prior years. Time would be much better spent on a personal-finance course or other valuable life skill vs. yet another run at a tired classic. Bottom line: Don’t just add more requirements. Reevaluate what is most beneficial today and drop the outlying courses. It should be a no brainer “personal-financial management” should be part of the high school curriculum — as should Civics. I think teaching a Civics class is equally important. My kids did not take a “Civics” class per se, but they were given a little Civics in history class. However, I took a whole year of Civics and that should be reinstated. My class was very good — we went to a courtroom and I participated in a “Model United Nations”. My class had a good teacher, but that was not always the case and even worse, in talking to HS teachers, many have met (real or perceived) hostility from parents think the schools are pushing some agenda. For Civics, the class should do as many mock legislative or similar programs as possible (and vote on how to run the classroom or something), model U.N., town meetings, etc. as many as possible — avoid having kids just memorize things. I don’t remember much from the class but I do remember the model U.N. and our visits to the town hall meetings and discussion on how the congress works. Yes! Personal-financial education should be a requirement for Washington state students! I am one of many financial professionals — working and retired — who volunteer for “Financial Beginnings.” This organization teaches a basic module of personal-finance classes to elementary, middle, high school and adults at no charge. The organization was started in Oregon and expanded into Washington in the last five years. The way forward is for the Washington state legislature to establish more rigorous guidelines for basic personal-finance education. We do not have to reinvent the wheel; the curriculum of another state could easily be emulated. The establishment of good personal-financial habits, and the avoidance of bad ones, would pay huge dividends over the short, medium and long term. In the meantime, programs such as Financial Beginnings, and others, can offer excellent basic knowledge for no cost to at least some schools. I have been parenting for 36 and a half years and my children attended Seattle Public Schools from 1987 through 2014. This generation and those that follow use apps. There needs to be accurate and current information for students. Parents weren’t taught and often don’t know how or what to teach their students. These are basic life skills that should also be taught in the schools. This generation can follow up with their apps. We used to have home economics about how to take care of our homes. This good be a comprehensive spinoff that teaches things these students should know. I have been teaching a personal-finance class at Sultan High School for about 12 years and I absolutely think that it should be a required class, preferably for seniors. The feedback that I have received from this class over the years has been incredibly positive. Numerous times I have heard from former students, “of all the classes I took in high school, your class is the only one that I have actually used in the real world.” While I know this is not true, it is much easier to see the direct connection between personal finance and their actual lives than say a biology class. What’s disappointing to me, however, is that I only have 60 students this year out of 500+ in our high school. I don’t know that I have ever talked to anyone who doesn’t think that personal finance should be a required class, yet there hasn’t been much of a push to make it so. It seems to be gathering momentum but the biggest issue I see is “what do you give up?” We already have so many other requirements that students barely have room in their schedules as it is. With four years of English, three years each of math, science, and social studies, two years of arts, health/PE and world language, not to mention the additional math and science courses that college-bound students are encouraged to take, and there just isn’t much room. The problem is that in order to add personal finance as a requirement, we are at the point where something else has to give and when “everybody thinks their (expletive) is the most important” teachers in other disciplines will fight with everything they have to keep their classes as requirements. Math teachers will tell you that you need to know how to do polynomial expressions “because they are important” and language arts teachers will make you feel as though you are less of a person if you don’t know Shakespeare and read/write poetry on a regular basis and…I get it. It was important and held meaning to them and they chose to become teachers because they love that stuff. I would argue that many of the things that we require should really be electives for those pursuing careers where those subjects would be relevant or for students who just really have an interest in a particular area. Personal finance is certainly not the only subject that many people believe should be mandatory in schools. I have heard things such as cooking, basic first aid and parenting should be requirements as well. We simply cannot continue to add requirements without taking something away. Until then, I will continue to improve the future lives of the students who do take my class and tell people that “my (expletive) is the most important,” just like everyone else does.